Armando Mendez telling Victor Vance about 'his' drug shipment being seized by the VCPD. 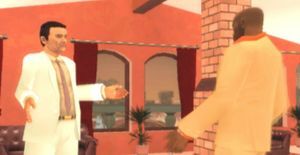 High Wire is a mission in Grand Theft Auto: Vice City Stories given to protagonist Victor Vance by Diego and Armando Mendez from their home on Prawn Island, Vice City. Victor Vance drops-by the Mendez mansion looking for more work. Armando Mendez is there and he's worrying about Victor. Armando explains that the cops have taken their coke and Diego tried suggesting to the police that the cocaine belonged to the Vance Crime Family and says he's got a paper showing Victor's involvement in it. Victor drives to the Junkyard in Little Haiti and takes a Maverick with a magnet. The first container of the cargo is around Viceport at the police impound, and after Victor lifts it up with the magnet, he drops it at the Escobar International Airport. The second and last container is being moved out to the police station in Little Havana by a big truck, Victor lifts it before it reaches the police station and drops it at the same place as the previous container. Suddenly when he drops the second container, Diego is in trouble and is being chased by the Bikers who are damaging his car and Victor has to save him before his car catches fire. Victor flies to Ocean Beach and picks up the car and as instructed, he drops it at the multi-storey car-park there. Armando Mendez: Whoa, thank God you're here. Victor Vance: What's going on? Armando Mendez: I've got some bad news, friend. You're in terrible trouble. Armando Mendez: Diego is beside himself with worry. Victor Vance: Wait a minute, hold on. What are you talking about? Armando Mendez: The police got some of our merchandise. But it's you we're worried about. Armando Mendez: You see, we're utilitarians - the greatest good for the greatest number. And there are two of us, but only one of you. So Diego suggested we explain to the police that the cocaine was yours. Victor Vance: What... [sarcastically] Oh-ho-ho, oh, yeah, that's very thoughtful of you. Armando Mendez: And unfortunately, I have this paperwork showing your involvement in the project. Unless we could resolve this little distraction. Victor Vance: And how do you suggest we do that? Armando Mendez: You steal the cocaine back for us. It's been impounded. You must steal it before they take it back to the police station. Thank you, Vic. I do so enjoy our conversations. I find you very inspiring. Victor Vance: Thanks. Here we go again. Diego: There are some cargo containers at the police impound. Our coke is hidden inside them, all mixed up amongst the other cargo. Victor Vance: Don't worry. I'll get them out of there. Diego: Muy Bien. I'll be in touch. Diego (on radio): Senor, take the containers to the drop-off point. Diego (on radio): Caray! The cops are moving the last container. Get it back! Vamos! Diego (on radio): I can't believe you did it! Senor, it's been a pleasure watching your work. Adios. Diego (on radio): Senor! Senor! Please, help me! The Bikers are after me! I can't get away! Oh, Madre dios! Diego (on radio): Come quick! Help me! Please, senor! Diego: Thank you, senor! You're incredible! Victor Vance: No problem. Where do you want me to drop you off? Diego: [laughs] Oh, please, don't drop me, senor! [laughs] Take me to the car park. Gracias! Diego: Gracias, senor! That was fantastic! Adios! The reward for completing this mission is $1,500 and the unlocking of Burning Bridges, if the missions Where it Hurts Most and Farewell to Arms have also been completed. Many people may confuse the Diego in this mission with Diego Mendez, one of the leaders of the Mendez Cartel. This page was last modified on 28 August 2014, at 14:20.